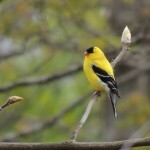 After a pretty harsh Winter and a very rainy and flood filled early Spring, the Blue Ridge mountains have finally emerged with gorgeous birds, plants and flowering trees. 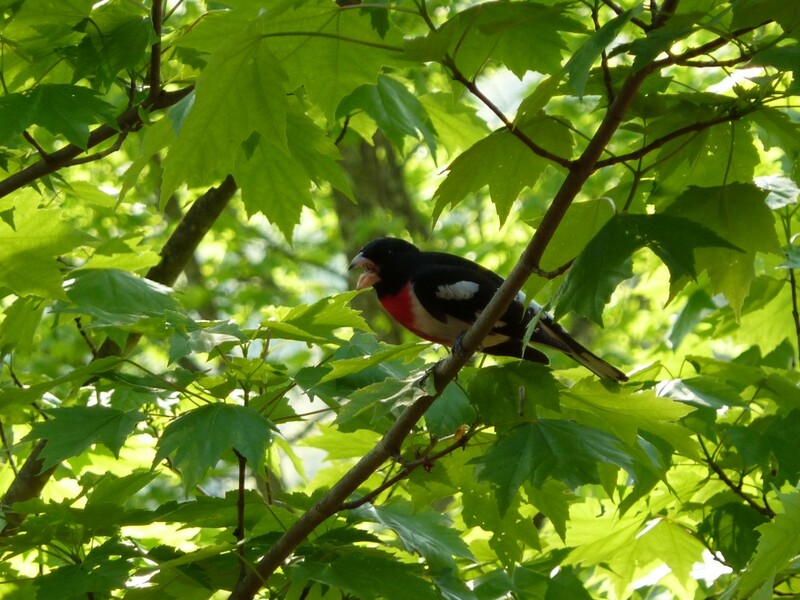 We arrived May 10 to find few buds on trees and plants, no hummingbirds and when we left May 19 the trees were in bloom, flowers were abundant, hummingbirds were back and the birds’ nests were populated. We took a drive up to the Mt. Airy region to do some ‘antiquing’. We stopped in at The Antique Mall of the Foothills. They call it antiquing, but I am used to real serious antiquing from the New England area. These are more like consignment shops, similar to the one on King St. I love browsing all the old kitchen utensils, antique irons and meat grinders. Most of which I had seen in my grandmother and great- grandmother’s kitchens. Evan loves all the old LP albums and rock n roll signage. After browsing for hours, I went to sit in a rocker at the entrance of the shop. The shop’s proprietor said to me “oh don’t sit there.” When I asked why he told me “you’ll end up buying it, it’s so comfy”. I assured him I didn’t have need of another rocker and proceeded to sit down. 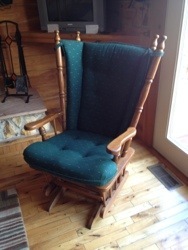 You too can try the rocker, as it now resides in the living room of our cabin. 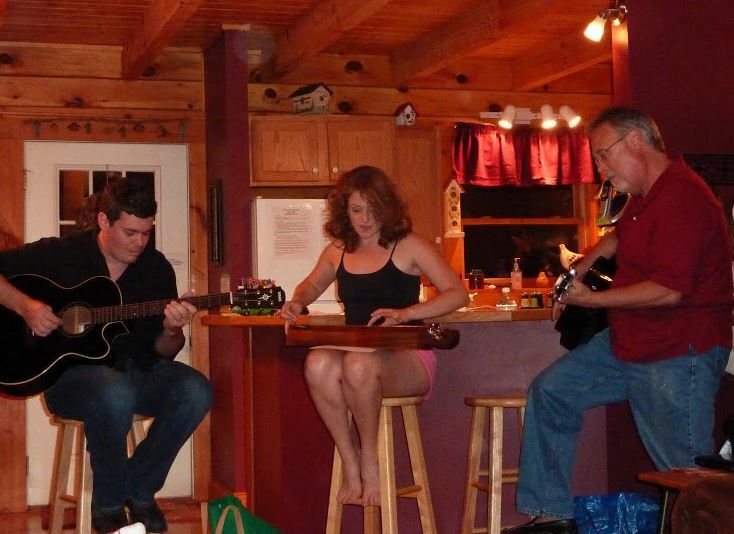 2 Guitars and a dulcimer serenade goo for her birthday! 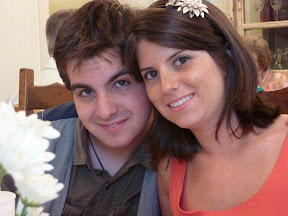 What a talented family! Marisa always looks forward to spending her birthday in Boone. 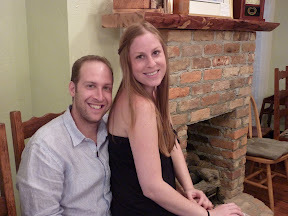 Our tradition was dinner at Twigs,but this year we decided to try something different. 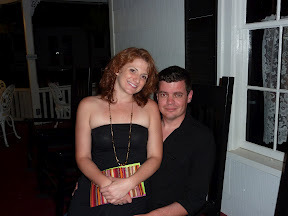 We settled on the 1861 Farmhouse, a wonderful Farm to Table restaurant/winery in Valle Crucis. The place is outfitted in a very shabby chic style with mismatched furnishings, mismatched dinnerware and lovely lace curtains throughout. One dining room is more charming than the next. They serve salad from greens and veggies they grow in their own fields. One of the high points of the lovely evening we spent there, was when the owner Steve offered to take us on a personal tour of the winery. He showed us how they built the winery in another building INSIDE the carriage house. they left the charm of the old building while providing the modern efficiency of the new construction. Our mountain herb garden seemed to winter over pretty well. I cut back the winter savory and the sage. I replanted some oregano and rosemary. I washed and bundled the sage and savory for guests to use. I have the bundles hanging by the fireplace to dry. 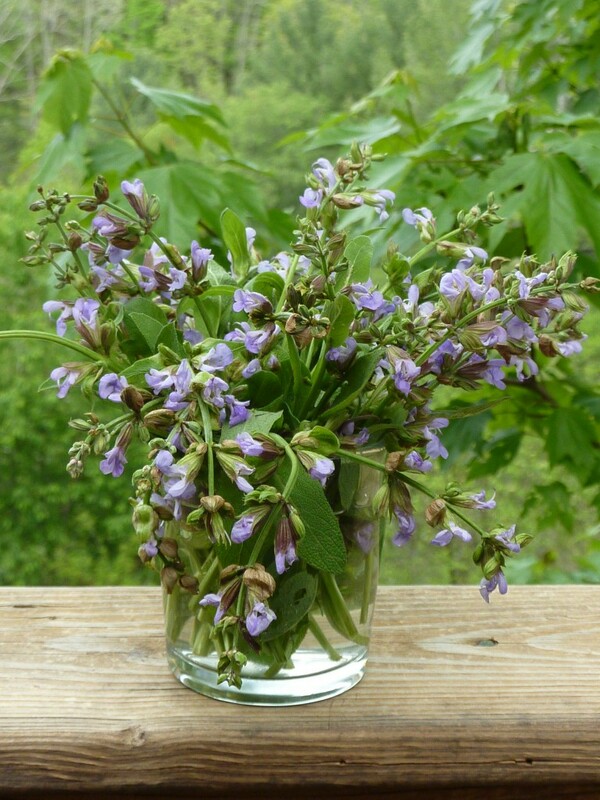 These gorgeous blooms are the sage blossoms. 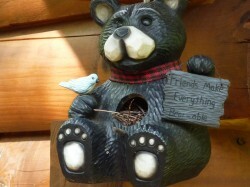 The Carolina Wrens seem to like our bear birdhouse. 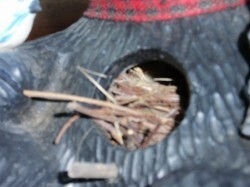 Last year when we first hung it out, they nested in it right away. 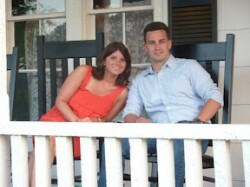 Stephen and Sue were nice enough to send us pictures of the new additions to our Boone family. Last year’s hatchling were seen in early July. This year is a much earlier roosting, perhaps because of the mild winter. Carolina Wrens usually roost for about 2 weeks and lay 4 – 6 eggs. The eggs are creamy or light pink wiht brown markings. They hae been known to roost in unusual places such as mailboxes and car bumpers. 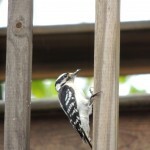 If you are at the cabin and manage to get photos of the fledgling, please send them to me! 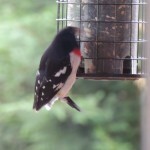 For the first time, I have seen a rose-breasted grosbeak at our birdfeeder. I have always known they are present in the high country in Summer. 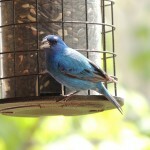 But considering they only spend a few days at feeders, I was fortunate to have a vist from one for 2 – 3 days. Typically, the male migrates a few days before the female, and this is the time he visits feeders. 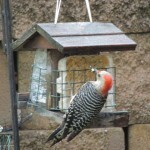 Once the females arrive, the males become territorial and do not visit feeders often. This plump, bright faced beauty seemed to have alot to say. 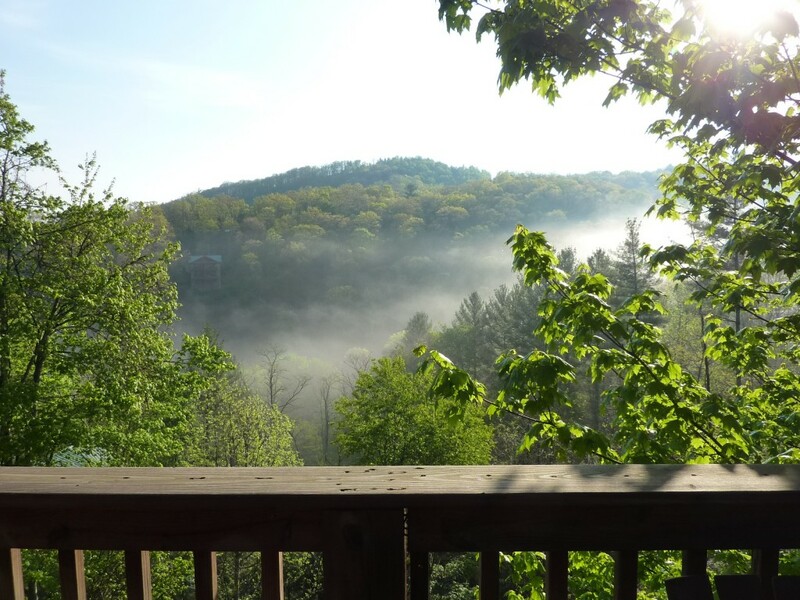 It is always so thrilling to hear the Bzzzz of the hummingbirds in the morning and afternoon at our cabin in Boone. 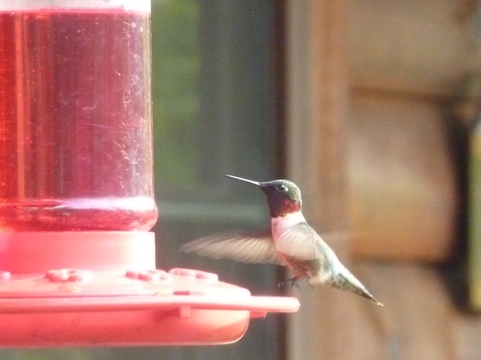 No sooner do we set out the hummingbird feeders and we hear that familiar Bzzzz Bzzzz Bzz of them fighting over territory. Sometimes if we are sitting in the adirondack chairs in the afternoon, they will engage in such a battle that they actually buzz through our hair! 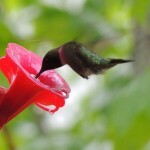 Our ruby throated hummingbirds are so familiar with us and the cabin that they come within 2 feet of us standing there. They look particularly green this year. A great morning fog over the river after a thrilling night of boomers and lightning. Nothing like awakening to the crisp scent after a mountain rain! 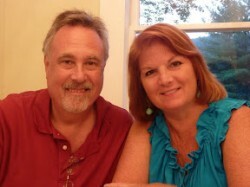 Trish, arrived home a ahort time ago after a wonderful week at Bearfoot Hideway. 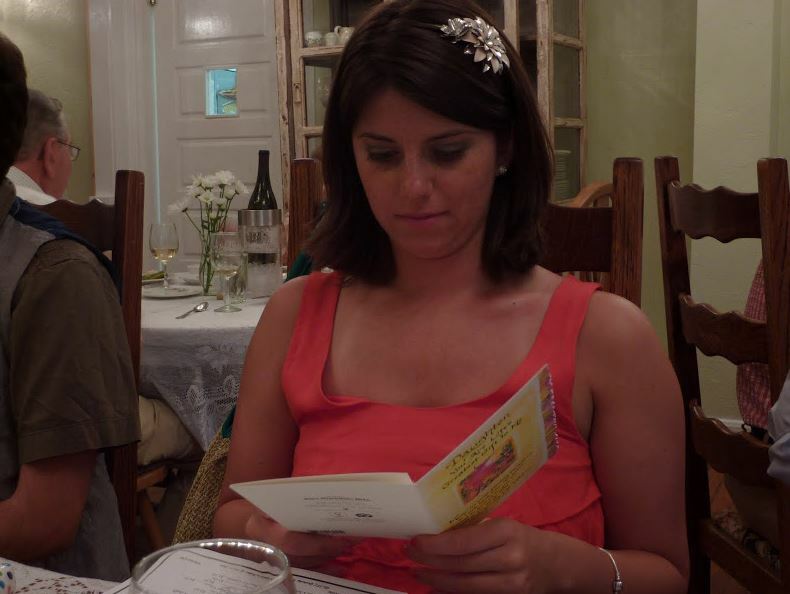 Was much cooler there than the 90 degree reception here in central new york. We enjoyed the wildlife around your lovely home. A deer visited the front yard regularly, chipmunks, squirrels, birds, hummingbirds all seen. We used a mix of sunflower and regular seed for more variety of birds. 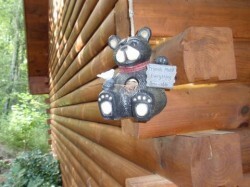 I am sending 2 pictures of the bear birdhouse, you may be able to make out the bird in the house. There were 3-4 babies and mother wren swooped by us about every time we walked up or down the stairs. Also enclosed is a picture of a bear wastebasket we bought for your home, it seemed to go with the decor. Had to go back to Blowing Rock the next day and purchase one for my daughter or the one for you might have disappeared. I placed yours on the hearth, obviously you may have a better place for it. P.S. the bird store you mentioned is no longer there, closed over a year ago according to another store owner next door. Never did find a place.